Furniture, Functional Value, Fabrication • How can traditional joinery methods be updated for new materials and opportunities? This experimental take on a trestle table explores an alternate joinery method to add structural tension to wooden construction. Through the making process I had the opportunity to explore many in depth furniture fabrication techniques and apply them to a fresh design. Held together by the two ropes, the design is entirely flat packable. Made from white oak, the tension table is sturdy and heavy. The two posts, with asymmetrical tenons on each end, lock into the four runners to form the leg structures. The stretcher fits through mortises on each post and is held in compression by the two ropes, which also hold the feet and runners into place at the ends of the posts. The two leafs of the tabletop slide onto the top runners using dry fit UHMW plastic dovetails and blind dovetail grooves. 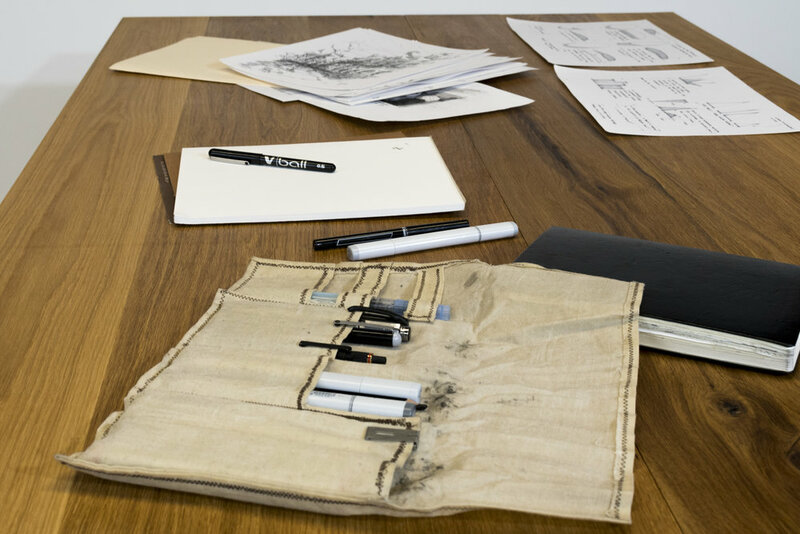 The idea behind the table is derived from thoughts on joinery methods. From the beginning, I wanted to explore the form factors beyond a typical hardware-dependent construction. Tension, an established but rarely used (in furniture) method of keeping parts together, became an interesting opportunity to explore in depth. 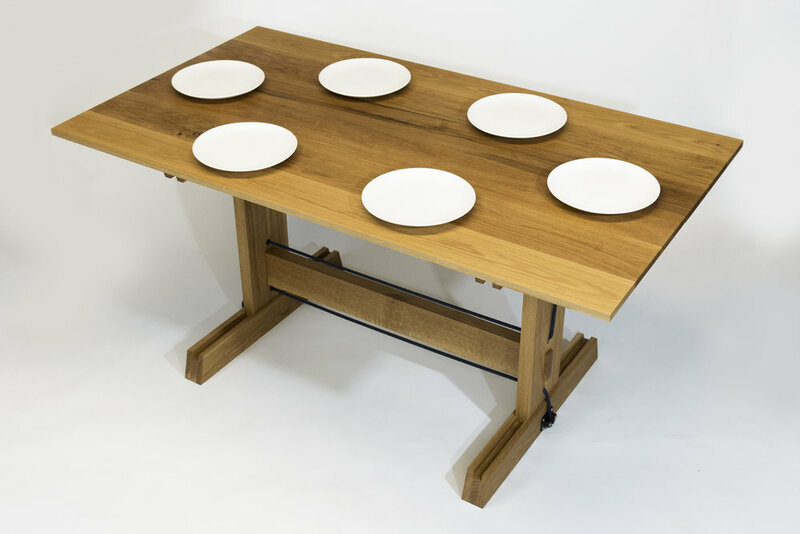 I first explored the dimensions of existing tables to better understand the size and scale of a comfortable six person dining room table. Because of the trestle location, a person can sit on each end of the table without being bothered by the posts themselves. Scale models helped me to better understand the size and scale of the table. Mortises were cut as groove pairs later glued together. The four post halves were aligned, clamped, and transferred sideways after each cut. The dado created a consistent edge quality which gave more consistency to tenons later in the fabrication process. Dovetails on the posts and stretcher were made on the table saw. Pictured on the left are the preliminary cuts for one of the asymmetrical post tenons. 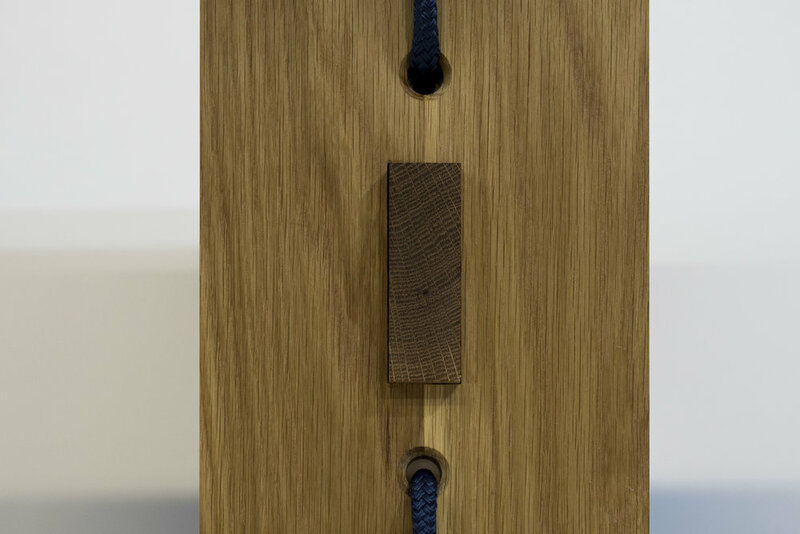 Holes for the rope are chamfered to better distribute load around the angle and reduce kink. Dovetail grooves were routed into the bottoms of the two tabletop leafs with a laser cut acrylic jig. 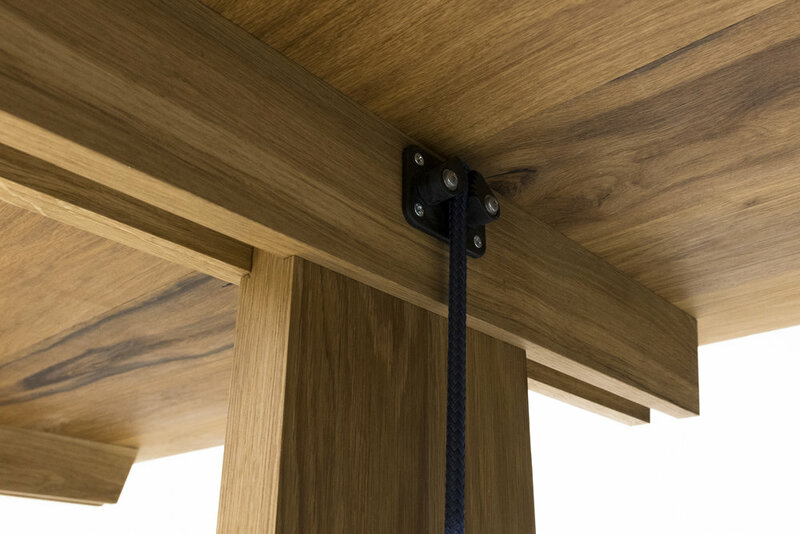 The dovetails themselves are made from high strength UHMW and screwed to the top table supports.